Short Messaging Service (SMS) is a handy technology to send a text message to your contacts via a phone device. SMS has become very popular and is widely accepted. The only problem with SMS is its limitation of the type of data which can be sent and the charges that are incurred while sending SMS. We discuss some of the free messaging apps which will overshadow the SMS technology in the future. With the rise of smartphones, free mobile messaging apps are taking their way into the short messaging industry. For using free messaging apps, you will need to have an Internet connection (Wifi, GPRS etc.) on your smartphone device. 5 Facebook Messenger – Similar to WhatsApp but doesn’t work with phone no. The downside of these apps is that if you do not own a smartphone which has one of the most popular mobile Operating Systems like iOS, Android, Blackberry or Windows Phone, you won’t be able to make use of these services. When it comes to the best free mobile messaging app to replace your SMS, we have already compared the two most popular ones. Here you will find a list of mobile messaging apps which will give you a better idea of which app suits your needs. WhatsApp is free for the first year and the company extends your trial after your first year is over, so the app deserves to be mentioned in the list. The application is compatible with 6 different Operating Systems. The setup is pretty simple and speedy, unlike other IM applications. You can even exchange files through this app. WhatsApp works on your phone number and takes very less bandwidth unless you are downloading files. You don’t have to pay any texting fee when using this application. Its interface is clean and easy to understand. Privacy settings of this application are also strong. Viber is similar to WhatsApp but it offers much more than just file sharing, sending messages and profile set up. You can also make audio and video calls. But it is recommended to have 3G, 4G or Wifi for VoIP calls as the application consumes a high amount of bandwidth. The application is compatible with 7 different mobile platforms which include Windows Phone 8, Android, iOS, Nokia S40 Symbian, Nokia S60, BlackBerry, and Bada. TextFree is a great alternative to SMS and MMS technology. Unlike WhatsApp, the application is free forever. You can send free texts to more than 35 countries. The best thing about this application is that it doesn’t work like IM or texting applications. The receiver does not have to own this application. It’s just that you must have a smartphone and an Internet connection, while for others, the application works just like receiving normal messages. TextFree is available for iOS and Android only. Yes! It does provide calling option but for this, you have to download its twin application Pinger. Skype is not typically an IM app, however, it could be counted in messaging apps for its exceptional features. It isn’t just a personal application, but Skype has become a community now. And this is the joy of using Skype. You will probably find two third of your friends and family members using it. So, Skype fulfills the purpose of a messaging app. Skype is supported by Android, iOS, Windows Phone 8, BlackBerry and iPhone. You can send texts, share files and do voice and video calling as well. The application does not work on your number, it works through a Skype ID. 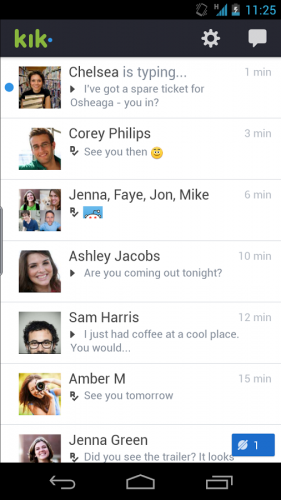 Facebook Messenger – Similar to WhatsApp but doesn’t work with phone no. The application is function-wise similar to WhatsApp however it doesn’t work through your number. Facebook messenger is an application by Facebook which is directly connected to your Facebook account. Like Skype, the application works on the Facebook ID and lets you share photos, voice notes, and videos in a single touch. The application is only supported by Android, iOS and BlackBerry OS. 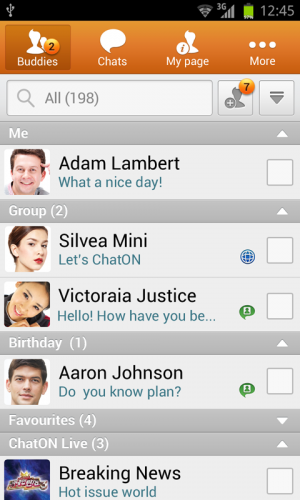 An application by Samsung, ChatOn lets you do whatever any other IM application allows you. Besides chatting, you can share files like emotions, animation messages and MS Office files. So, ChatOn is best for business people. It is supported by Bada, Android, Blackberry, iOS and Windows Phones. The application is totally free. The interface is a bit messed up, but still, you can enjoy using it if your phone does not support any other IM app. Update: As announced by Samsung, the ChatOn service has been discontinued for all users except in the US on 1st February 2015. Ultimately it will be shut down for everyone. You can read more about ChatOn being discontinued here. 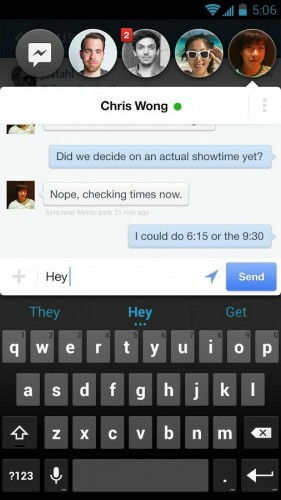 WeChat is just like LINE but it also has some additional useless options. 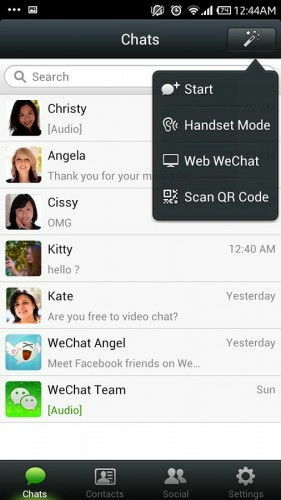 Developers sometimes forget the fewer options and better usability relation and apps like WeChat, LINE, ChatOn comes up. Like these, the app is free forever. Apart from all the basic platforms, the app is supported by Nokia S40 and Asha platforms. 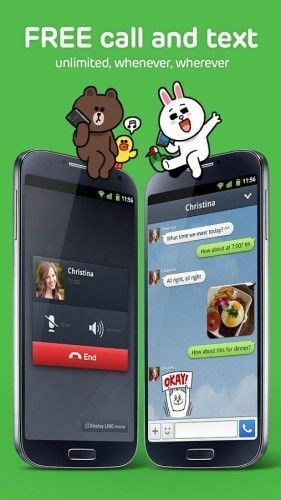 Kik is also a typical IM application which is supported by iOS, Android, Windows, Nokia, and Blackberry. The application is free, fast and simple. You don’t get lost in a sea of options. Kik keeps your IM experience simple and smooth. So, after WhatsApp and Viber, I’ll prefer Kik. 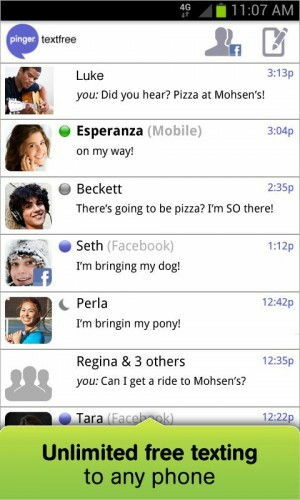 This unlimited free messaging application is supported by iOS, Android, Windows Phone 8, BlackBerry and, luckily for the Nokia Asha platform as well. Besides this, the application provides voice and video calling. 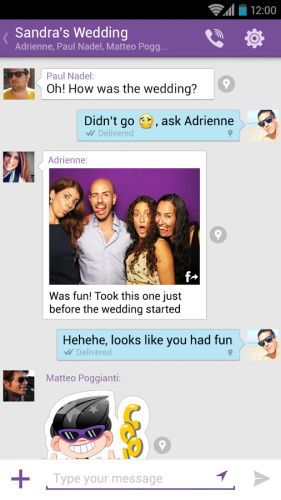 You can share photos, voice notes, and videos just like Whatsapp, and Viber. But the video and voice calling option are restricted in the Nokia Asha platform. So, you can only text and send videos on cheaper Nokia phones. Tango is another great mobile messaging application that has functions like any other IM application. Messaging, voice and video calling, and sending files are few of the main things that Tango does. Its interface is orange-colored and looks very cool. Supported platforms are iOS and Android. Tango is free and lets you use it on your number. The application works on 3G, 4G, and Wifi. iMessage – The best text messaging app if you are an iPhone user and follow the Apple ecosystem. IMO – Very popular in the Gulf countries and is best for video calls. Signal – Very good for encrypted and secure one on one or group communication. 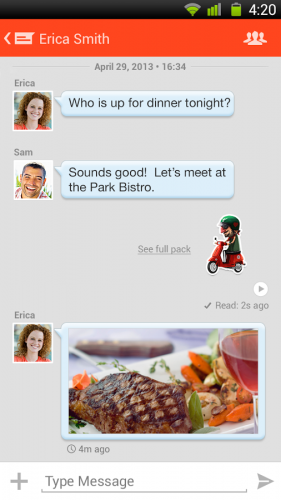 Did we miss a mobile messaging app which is useful and easy to use? Please share your thoughts in the comments below. Please note that we will keep on adding some frequently asked questions below. If you have any questions, you may ask us in the comments below. Can I send text from my computer? Yes definitely, if you are using Android phone, you can install Android Messages app from Google Store and receive and send text messages from the computer directly, using https://messages.android.com/ URL. You need to be connected to the Internet on both your Android phone and your PC to send messages. Can I hide my phone no. while texting? If you are using an iPhone then it’s pretty easy, just install SpoofCard App. SpoofCard will let you display any Caller ID of your choice while calling or texting. 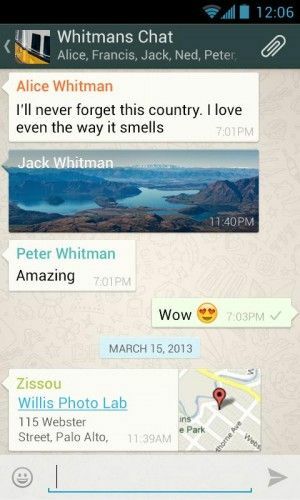 Previous ArticleWhatsApp Vs Viber – The Best Phone Messaging App? Good collection Arfa but I think you missed out some of my favorite ones including Google Talk. I think it supports Android too? Yahoo Messenger also has an app for Android. Nimbuzz and IM+? Unison can be a good choice for group chatting. If you are using an old phone, eBuddy can be a good choice as it supports Java based phones. I have used Handcent on my Korean Samsung Galaxy S which doesn’t go well with the standard SMS app. Go SMS Pro is also free and useful. What are your thoughts about these apps? Google Talk doesn’t support file sharing. Yahoo and eBuddy are good options but still they can’t be listed in the top 10 above. Maybe because of low number of users and old interface. I mean i’ve used them, and in my opinion, they aren’t that user-friendly. You have to register properly, which takes a lot of time.